100 m or so beyond the sportsfield seen at right. 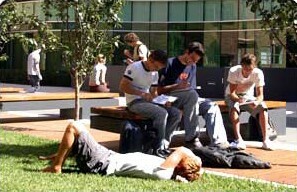 The campus is serviced by several bus routes, which are explained on the UNSW Transport Program. From Eddy St, outside Central Station, UNSW Express buses (route 891) run to campus every 5-10 minutes in rush periods. Otherwise routes 391, 393 and 395. From Circular Quay or Elizabeth St, City, 392, 394, L94, 396, 397 or 399, plus the 890 and 892 UNSW Express in rush periods. The 400 and 410 buses run from Bondi Junction past UNSW. 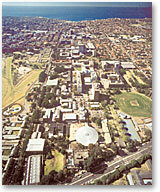 The 370 bus route runs from Glebe to Coogee Beach, via the Sydney University and UNSW campuses. Also served by the M10 and M50 routes. From the 391, 392, 393, 394, 395, L94, 396, 397 or 399, M10, 400 or 410 buses, alight in ANZAC Parade, head West up the big walkway until you come to a big red building (the Red Centre) on your right. Go under it and you'll come to a rather nice little courtyard in an old brick building (Old Main Building). Go in one of the entrances on your left, turn left and you'll see the Acoustics sign. From 890, 892, M50 and 370 buses, alight at the first bus stop in High Street. Cross the road and head South untill you hit the big, East-West walkway. Turn left and continue West until you come to a big red building (the Red Centre) on your right. Go under it and you'll come to a rather nice little courtyard in an old brick building (Old Main Building). Go in one of the entrances on your left, turn left and you'll see the Acoustics sign. The following series of maps shows the campus near the centre, on maps of increasing scale. UNSW on Google maps allows easy navigation.